A water feature adds life to the garden and forms an attractive centre of interest. You can enhance the attraction by adding some movement to your water with a cascade, waterfall or fountain. 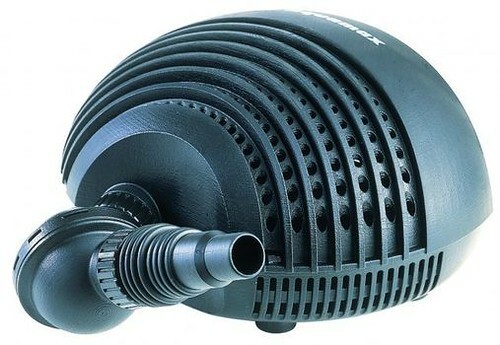 This not only makes for a more interesting feature and adds the soothing noise of running water to your garden, but can help to aerate the water, aiding fish and wildlife and reducing algae growth. Most natural bodies of water benefit from a constant supply of fresh water to replenish them and keep a natural balance. 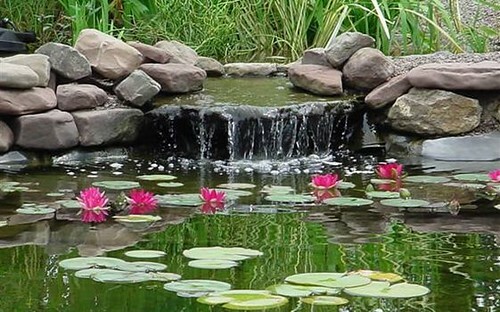 It’s possible to create a balance with plant life but the easiest way to replicate this in a smaller pond is to create an artificial flow of water. In order to do this you will of course need a pump. Most of the types for sale are versatile so that by adding the right fittings you can use them for a variety of tasks. 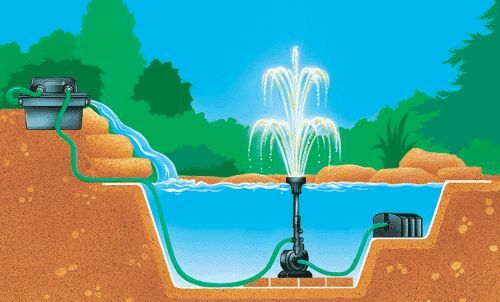 For a small to medium sized garden pond you’ll need a submersible pump (one that you place underwater) that’s capable of handling around 350 to 4,000 gallons per hour. You should aim to circulate the entire volume of water every two hours or so. To calculate roughly how much water is in your pond you can use a simple formula – length x width x average depth (in feet) x 6.25 gives you a number in gallons – if you prefer to work in metric take the measurements in meters and multiply by 1,000 to give the value in litres. 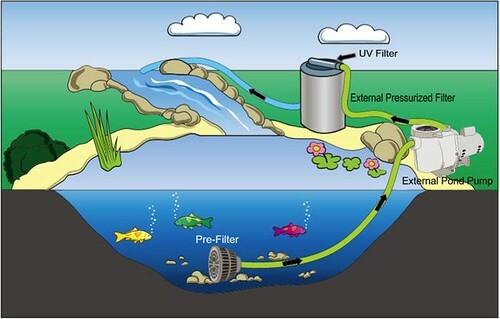 You can add biological filters to your pump in order to help keep the water clean. A biological filter allows good bacteria to multiply in order to break down harmful toxins. Very large ponds of 1,000 gallons or more capacity will benefit from an external pump as it’s more energy efficient and easier to clean. Whatever type of pump you choose make sure you have a suitable weatherproof external power supply – consult an electrician if you’re unsure. One of the most popular options is to add a waterfall. The key to doing this successfully is to exploit the contours of the garden to make it look like a natural feature. Adding an artificial raised area for the water to flow down will just underline that the whole thing is a fake. You need to line your waterfall in order to prevent water loss and you should also plan it to give a smooth, steady flow of water so that stagnant areas don’t develop. You will of course need a hose from your pump to carry water from the pond to the top of the fall. This can be concealed under plants or mulch and you can disguise the outlet at the top with rocks to make it look like a natural spring. Make sure your chosen pump has enough power to do the job, the greater the difference in height between the top and bottom of your waterfall the more powerful the pump needed. The pump specifications will include a ‘lift’ value which is the maximum height to which they can raise the water. When you first switch on the water may appear cloudy or dirty at first, don’t worry though it will soon clear after it’s flowed for a while. If your garden is largely flat then building a waterfall will take a lot of work and the result is unlikely to look natural. A better option in these circumstances is to create a fountain. This still has the benefits of providing movement and sound, as well as aerating the water, but is easier to install. You submerge the pump at the appropriate point – you may need to add bricks or stones at the bottom of the pond to ensure that it’s level. Most pumps have adjustable or interchangeable heads to give different fountain styles. You can adjust the height of the effect by varying the water pressure. Whatever type of water feature you’re building, a fountain pond pump provides a reliable and cost-effective solution to adding water movement to your design.